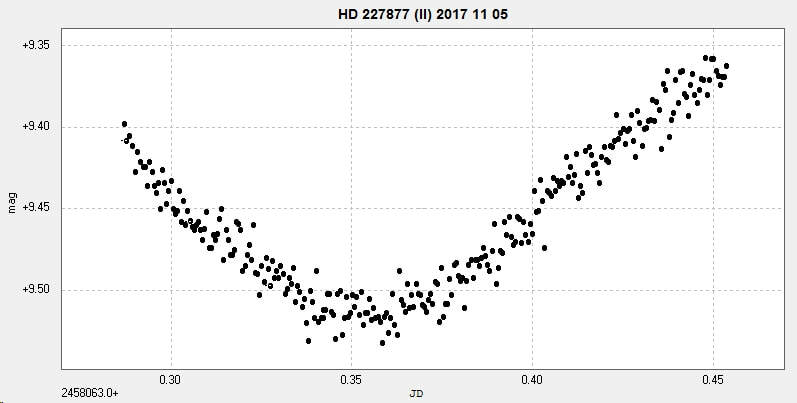 An eclipsing binary in Cygnus, my 17th variable star discovery and second eclipsing binary discovery, confirmed on 2016 February 26. 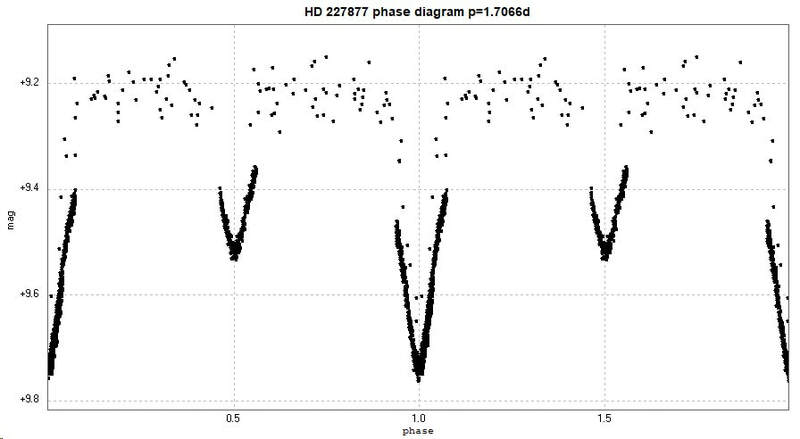 AAVSO VSX entry here. Photometry from 100 unfiltered images taken with the Bradford Robotic Telescope's Cluster Camera (BRT) 2013 July 13 to 2015 December 16. 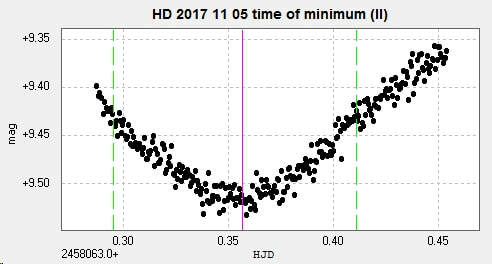 Obtaining this light curve was challenging as the star is close to another bright star (6 arcsecs away) that contaminated the measurements. These were corrected by the technique of 'deblending', where the estimates are corrected by removing the contribution of the nearby star. 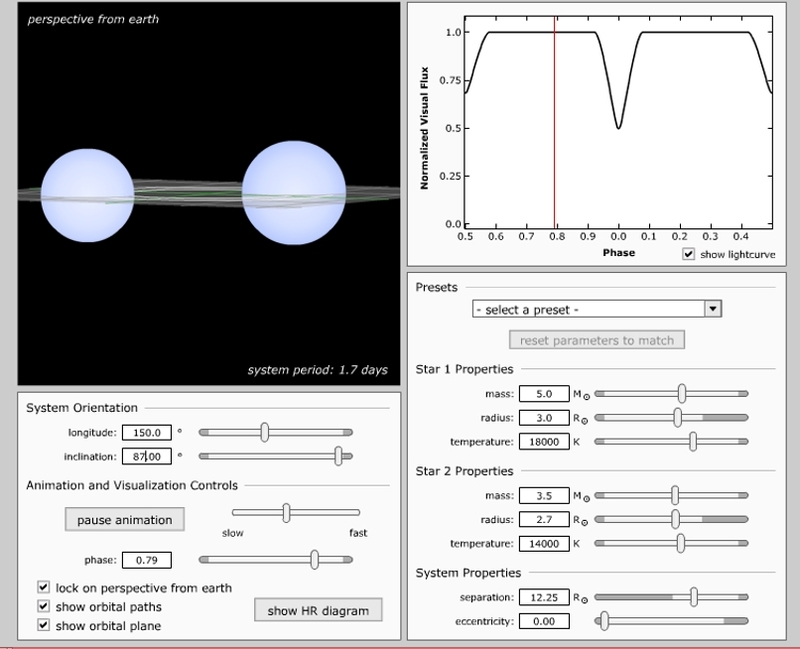 This is an attempt at modelling the system using the Phoebe modelling package. I used the star Alkaid as a starting point because it has a similar spectrum (B3V) to the new star. This gives a starting point of 6.1 solar masses, 3.4 solar radii, 1 350 times the solar luminosity and a surface temperature of 16 800 K. Also 0.3 mag = 32% difference in luminosity and 0.45 mag = 51% difference in luminosity. 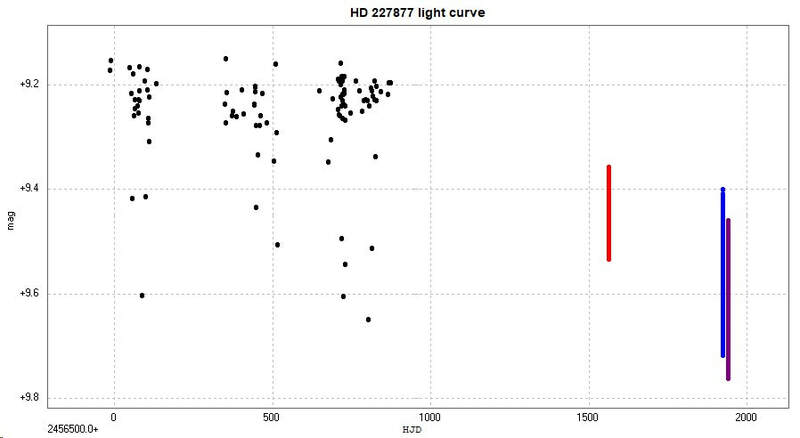 The various parameters were then adjusted until the derived light curve matched the observed light curve. How good a model this is remains to be determined! 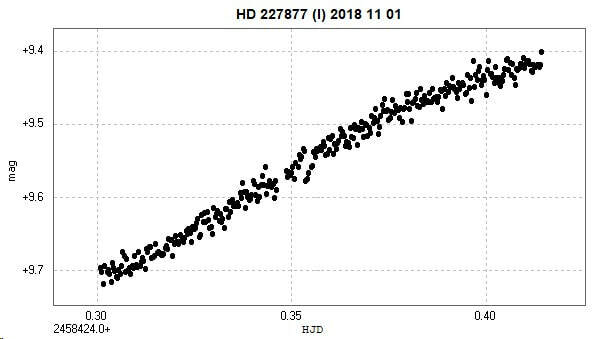 Secondary minimum observed from Somerby Observatory with the 2" Titan on 2017 November 5. The images were unfiltered. A primary minimum was observed from Somerby Observatory with the 2" Titan on 2018 November 18. The images were unfiltered. The corresponding time of minimum was calculated to be HJD2458441.349207+-0.000047. The above BRT data (in black), together with the secondary minimum (in red) and 2 primary minima (in blue and purple) observed from Somerby Observatory, result in the following light curve and phase diagram. 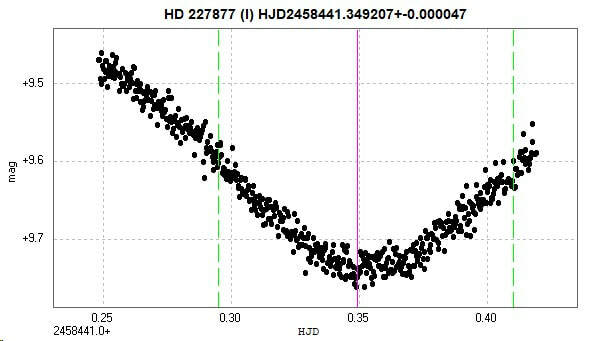 Below are a light curve and phase diagram constructed from photometry of 86 images taken with the Open University COAST 14 inch Schmidt-Cassegrain telescope between 2017 July 6 and 2018 January 1 using a V filter. 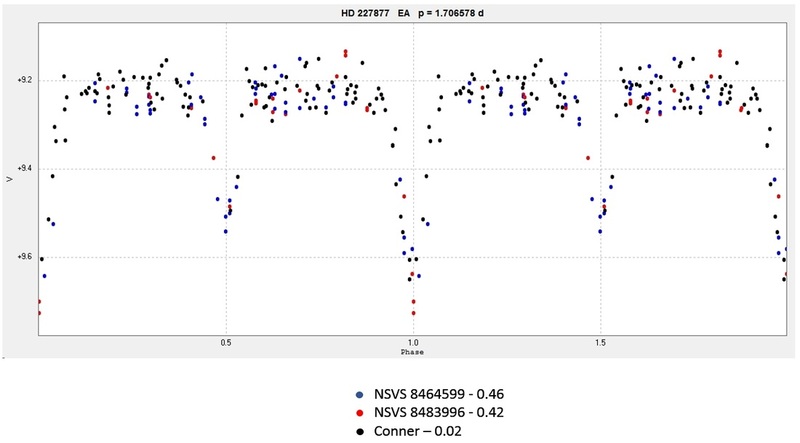 (The contribution of the nearby star has not been removed by deblending in these diagrams.) 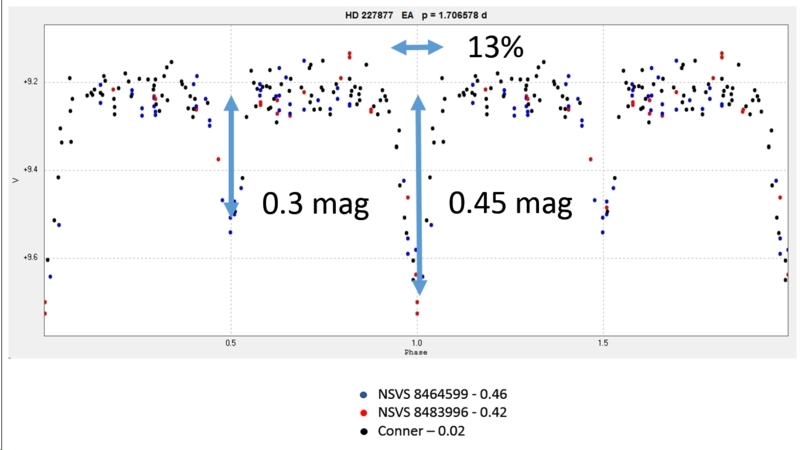 It is hoped to obtain more results from this telescope in order to obtain a 'definitive' light curve to help model this system.